to log out. 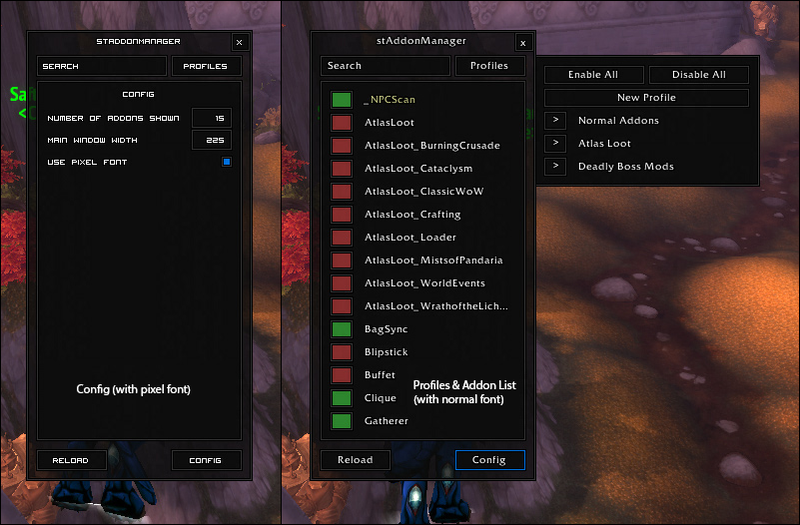 It has a search function for added convenience in finding a specific addon. To toggle the window, use any of the three slash commands (/stam, /staddonmanager, /staddon) or press escape and press the stAddonManager button in the Game Menu. New Profile Allows you to create a new profile, and saves the currently enabled addons to that profile. 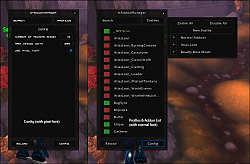 Remove This will disable the addons in the profile. Delete Allows you to delete the profile if you don't want it anymore. Update Allows you to update the profile. Legion changed the way setTexture works with color (it now uses setColorTexture). You can hold shift while scrolling and it will scroll an entire page instead of one item. Huh, that's odd. I'll check it out when I get back from vacation. Last edited by Safturento : 12-25-13 at 10:53 AM. 1.3.1 everything seems to works fine again, thank you! Last edited by Safturento : 12-19-13 at 09:40 PM. Last edited by Udangul : 12-19-13 at 04:43 PM. I'm still a great fan of your stAddonManager but today its broken a bit. Blizzard added a new "Store" Button to the ESC game menu and the "Addons" button is now melt together with the Logout and Macros button. Since we already have access to the blizzard shop with the mico menu (and this now button is just for blizzard to make money) it woud be great if you coud replace the Shop button with the stAddonManager button. It woud be very cool if you coud fix this asap. Thank you very much! Is there a way to lock addoons that are a part of every profile, like ElvUI and it's parts? I like what you have so far. Hopefully, your next version will add the stuff that I love about outdated Too Many Addons (profiles per character, easier to see which addon sets are loaded). Is there a way to change the font, I find the current one a bit hard to read. I looked in the lua, but the font reference seemed coded beyond what I could make out. Is there an easy way to change it to something like Ariel or Times? Last edited by Tonyleila : 12-08-12 at 08:50 PM.